Great way to drop the pasta! Spaghetti squash is one of my favorite hidden treasures that allows me to no longer feel deprived of the spaghetti I have loved since I was a child. Make it a tasty side dish with butter and parmesan cheese. Give it the spaghetti as a meal feeling by creating your own marina add meat if you want to give yourself added protein. Place cut sides down on a rimmed baking sheet covered with foil and put sheet into the oven. 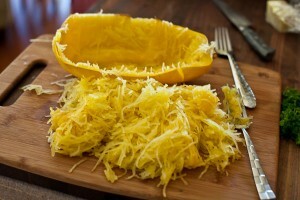 Bake for about 40 minutes at 450 degrees, or until you can easily pierce the squash with a fork. Use a fork to to scrape out the squash. Chop all veggies. Drop coconut oil into heated skillet to melt. Sautee veggies getting them warm, cover on low heat letting them simmer until cooked to a sauce. Pour olive oil on top after cooked for flavor. Optional - Add ground beef, ground turkey or cooked chicken.